[ARCHIVED THREAD] - Magpul MS4 for the Colt 6940? Is this the best sling for this rifle? I seen a lot of youtube vids with the rifle in front of the shooter but what about over the shoulder? It looks good but I wanted to ask you guys before I spend $60. I've been using one for a while, just playing with it and wearing around home and the farm. And I would prefer something with a wider strap or padding if you are going to let it hang for long periods it starts getting uncomfortable fast. This is my first "real" sling though so I can't recommend another but I think VTAC has something similar but padded. After a close look I can see how I'd mount the front but not the back. How does it attack to the rear of the gun? I looked again. I do have a sling mount on the back and push pin hole in the front. I guess I need a hole in the rear to fully utilize the MS4. 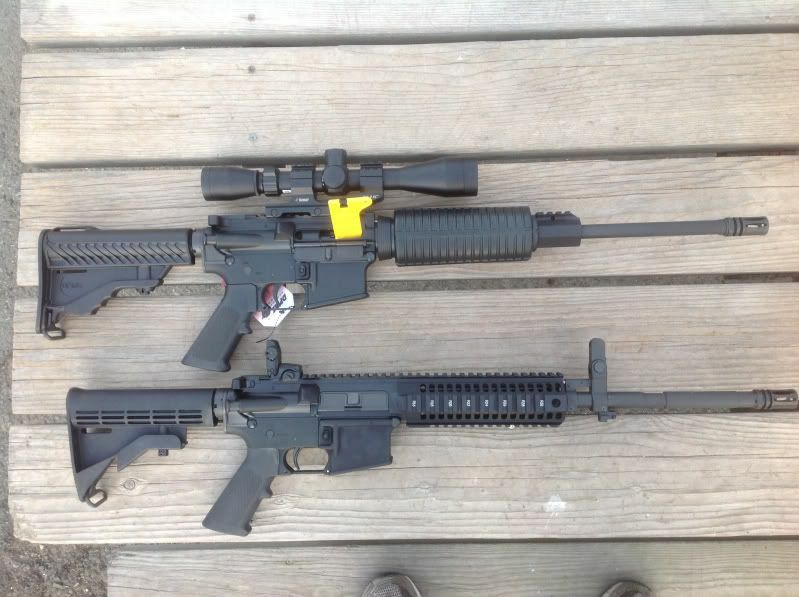 Also, the top rifle is a DPMS with no front attach point, how can I sling this one? My other rifles have the $5.00 Blackhawk slings, if I can't find a better solution I might go that route. You could do something like this http://www.impactweaponscomponents.com/product/45-offset-1913-rail-qd-rotation-limited-sling-mount-n-slot/ and mount it on your gas block, then get a QD endplate(link below) for both of the rifles and you will be good to go. to keep it super simple a 2 point setup allows for a much more comfortable carry of the weapon either on the back, across the torso or hanging off a shoulder, its the 'classic' sling design. great for carrying a weapon for long periods of time or over distance, howefver none of those positions favor quick or easy shouldering to fire. a single point sling on the other hand lets the weapon drop down and hang muzzle down right at the shooters chest vertically. it also for a very fast transition to shooting and more importantly allows you to easily transition from strong shoulder to weak and vice versa. its somewhat less comfortable and is much better suited for shorter term use, but the gun is always right there, and most slings have some type of release mechanism which lets you loosen the sling size and let the weapon hang down and to the shooters side. the single point setup would solve your mounting issues as well. "Whenever there is any doubt, there is no doubt. That's the first thing they teach you." I disagree with this. Most soldiers seem to use 2 pts these days. I think single point may work better if it's ONLY used for retention (such as CQB), but is very impractical if actually USING a sling as a sling (to retain, carry, sling, and occasionally stabilize a rifle). Single points are kind of "tacticool" (or DEA/Breacher/Swat look) and have a habbit of punching you in the face/jaw when you least want it. 2 pts have become WAY more useful with side mounts and quick adjusters. Since those two adaptations, they are kind of the best of both worlds. As stated though, depends on your need. Simply retention or other uses will dictate your best option. That is what I did with mine. In my experience, Magpul slings are overrated, and somewhat difficult to contend with, especially with the loop ending up in the region of your armpit. IMO, Blue Force slings are easily and arguably some of the best slings available, and very configurable. Regardless of the brand, one of the clear advantages of a two point unpadded sling, is the ability to use it as originally intended by the military - more than just a carry strap -- a shooting sling, a true stabilizing point to hold the front of the rifle tight by exerting tension back against your upper arm or body. That is hard to do with a padded sling. The Magpul MS3 I use (converted to run with QD swivels on each end) works very well for both purposes and is quickly adjustable. As converted it works like an MS4. I set the default length to produce the correct tension for use as a tight shooting sling and that usually happens to also work well for two point carry, but can be easily adjusted very quickly if I need it a different length. I find this natural, coming from a hunting background and using shooting slings for decades.